For those who want to spend a holiday in a city that has wonders to be explored, otel.com announced its special rates on Shangai hotels which can be found on the website of the company here: http://www.otel.com/. Shanghai is the biggest and most visited city in China which is divided by the Huangpu River. April, September and October are the most dense periods in the city; so, booking hotels in Shanghai in advance is very important. People may attend the Shanghai International Tea Culture Festival or the Shanghai Peach Blossom Festival featuring the beauty of peach blossom, local delicacies and craft works. Shanghai Tourism Festival and Shanghai International Music Fireworks Festival are also held in the city and the city hotels in Shanghai are almost full during those festivals. In his speech, Metin Altun also mentions the two top hotels in Shanghai, which they are selling with a special rate. The first one is Mayson Shanghai Zhongshan Park Serviced Apartment. The apartments are a 15-minute drive from the Shanghai Train station. The rooms have many facilities, just like a house, including a kitchen, washing machine and free internet. Massage services and a sauna are also available on-site. 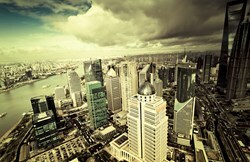 The second one is The Westin Bund Center Hotel Shanghai. The luxurious hotel offers accommodations with an indoor pool, a spa and free parking. People may choose their favorite hotel near the popular landmarks or city center and book with their system. As a branch office of Met Global, otel.com provides over 150,000 hotels all over the world on its website. The website also offers over 20 languages and currencies for all nationalities in the world.